Rieger is the leading German manufacturer of body kits and accessories for Audi, BMW, Volkswagen, Mercedes-Benz, Ford and many others. Rieger body kits and accessories will make your car stand out in a crowd with their great lines, excellent fit, and a truly German engineered product. 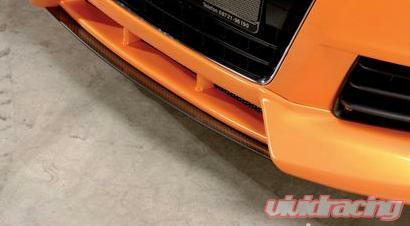 Front splitter fits to the bottom of the Rieger Front Spoiler R 55160. The splitter is manufactured from tough ABS plastic. PLEASE NOTE: Rieger Carbon Look products are special order pieces from Germany. Please allow 3-4 weeks for this product to arrive in the United States before it ships to you. Rieger Tuning Kfz-Kunststoffteile Design und Tuning GmbH, are a German based tuning and bodykit manufacturer. Rieger Tuning was founded by Toni Rieger twenty years ago. Rieger Tuning specializes in the development, production, and distribution of sport vehicle accessories. The main focus being on body styling with the development and distribution of aerodynamic parts for the vehicles of predominantly European manufacture. The worldwide interest in Rieger Tuning parts speaks to the exclusiveness and quality of their manufactured parts.